"Action, suspense, and good old romance. You’ll enjoy it!" The Columbia Review. “Will It Be Sunny Tomorrow?” by T.W. Anderson is the first of three (so far) installments in the “Reluctant White Knight” series. It combines the best ingredients of the “Texas Rangers” genre fiction, but with highly contemporary suspense, which is further enriched with themes of green energy, aviation and technology. The lead character, Tom Rowter, is a solid anti-hero, a toned-down version of Clint Eastwood at his best. He tells the story in the first person, matter of fact, no hype or showoff (well, maybe a reserved touch of bravado…). He’s cool, aggressive (or even deadly, when necessary), and delivers it all with humor. He clearly has a big heart, which carries a good chunk of pain and guilt, and he can handle a gun. In other words, he’s a good character, someone you would definitely want to spend more time with, literarily speaking. The story moves along at a fast pace with a good balance of action, dialogue, and internal thoughts and observations. The author, T.W. Anderson, clearly possesses a great deal of experience (or have done extensive research) on life in Texas, ranching, police work, green technology, nuclear energy, firearms, and—the most challenging to write about credibly—flying. 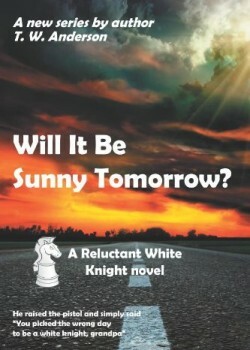 In summary, “Will It Be Sunny Tomorrow?” by T.W. Anderson is an intense story, never a dull moment, setting the stage for a promising series featuring the “Reluctant White Knight.” The novel delivers on the promise to keep you entertained throughout. You’ll feel the hero’s frustrations and pains, as well as his triumphs and, last but not least, his love for Texas. In short, with plenty of action, suspense, and a hearty dose of good old romance, you’ll definitely enjoy it. We look forward to the next installment in the series.